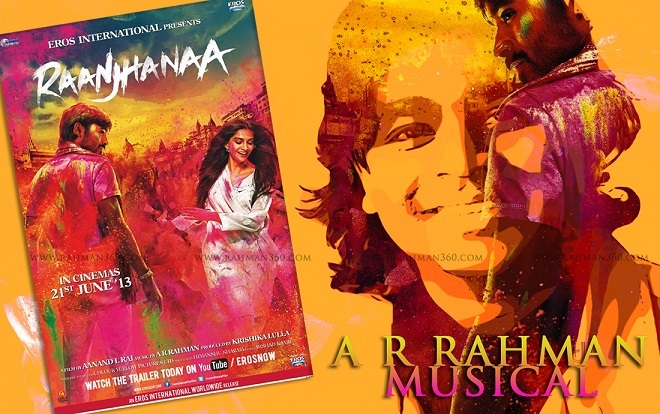 After a long wait, it’s finally out – the music of Raanjhanaa. But seems the wait was worth it. Do check out the music of Raanjhanaa. Rahman is back and how. Over to @Rohwit for its music review. Raanjhanaa hua – The ever so melodious (yet not as popular as I would like him to be) Jaswinder Singh starts the song and vanishes too quickly. Anyway, the song belongs to ‘at times out of sync Shiraz Uppal’ and that’s what you will love the song for. It just doesn’t try to ‘fit in with calculated singing’. The percussion arrangement – top class, the use of Sitar – exemplary. In fact, when the song ends, the sitar doesn’t leave your mind. Go ahead, try it! A racy tune marked with excellent violins (which literally take the song to it’s peak every time they appear), the song is top class! Watch out for the faint guitar riffs throughout! Banarasiya – Like the name indicates, a song that ought to remind us of Benaras. Starts quite rightly with Sarangi and flute (aided with the mandatory manjiras). Tune wise crisp, singing wise excellent, Shreya Ghoshal’s vocals! Sitar, Tabla and flute do their bit to raise the level of the song. The playful backup vocals by the hugely talented Meenal Jain and Anwesha add the right amount of playfulness and mischief to the song and you can picture the dancers in a group, exchanging glances and moving the neck and eyes in sync.The atmosphere is very ‘evening’ and the setting reminds us of the ‘Kotha’ culture. Piya Milengey – The song that begins with KMMC sufi ensemble going at it along with Sukhwinder is endowed with definitive bass and faint piano notes towards the beginning part of the song. The ensemble does an excellent job without getting loud at all. A song that is likely to appear in the background as the film paces up. Thankfully a bollywood – sufi offering that leaves an impact and not screaming singers in the mind as it ends. Aye Sakhi – A song that has the most delightful and talented singers around. Madhushree, Chinmayi, Vaishali and Aanchal sethi come up with a song that’s treated with sheer brilliance and arranged classically (and gives out a feel that the singers are practising kathak). In fact, the music and the feel around the ‘aye sakhi uljhan’ reminded us of ‘Jao rey jogi tum jao rey’ (from Amrapali). The ‘Tyun tyun tyun’ bit in between reminded us of the Tain tain tain song from Gangs Of Wasseypur. Still so enjoyable! The song has an element of ‘Kya dekh rahey ho tum’ from Taal in terms of feel but is vastly different tune wise. Thumbs up! Nazar Laaye – With lazy guitars, simple beats and Rashid Ali who is almost sleep-singing along with Neeti Mohan, the first impression of the song is ‘JTYJN-hangover!’ A typical song that gets skipped most of the times but stays in the playlist nevertheless. Aise na Dekho – A bonfire song. Starts with a frolicky mouth organ up and about with guitars. Yet another ‘JTYJN-hangover’ infected song, one might argue. Sung by ARR himself, the song scores low on words and the way they are pronounced (May be intentional?). Still the music arrangement is soothing. The whistling in between is simple and adds charm to the tune. Will I hear it again? Not now. The land of shiva – Heavy chants with heavier music setting and bells marks this piece and before you realise what is happening, it gets over. With a little over 1 minute running time, the tune is clearly added to compliment the overall feel of the album and is surely going to appear in the film. Tum Tak – May be it is Javed Ali who melts with the musical arrangement (The other way of looking it could be – his voice doesn’t stand out), the song is likeable only because of it’s music arrangement. The construct is too confusing, singing wise. Too many ‘Tum taks’ are irritating to say the least. The sudden change in the song on the other side of 3 minutes is bearable vocally. Kirthi and Pooja are efficient in the song. What lessens the impact of average singing is the excellent use of Manjeera and shehnai. AR Rahman somewhere mentioned that the use of shehnai in this album is a tribute to Ustad Bismillah khan. What we liked the most about the album is that it gives out sense of the film without being vague. The lyrics by Irshad Kamil are largely effective. The variation that we hear in terms of tune selection and treatment is vast, the music arrangement as usual top drawer! The album exudes a lot of confidence and the feeling of ‘durability’ oozes in good measure. Just when the promos were looking an ordinary, it is unbelievable what a brilliant music album can change it all. Now only if the film is good enough to hold it all together.